Hessing has been a specialist in the cutting and processing of fruit and vegetables for 60 years. 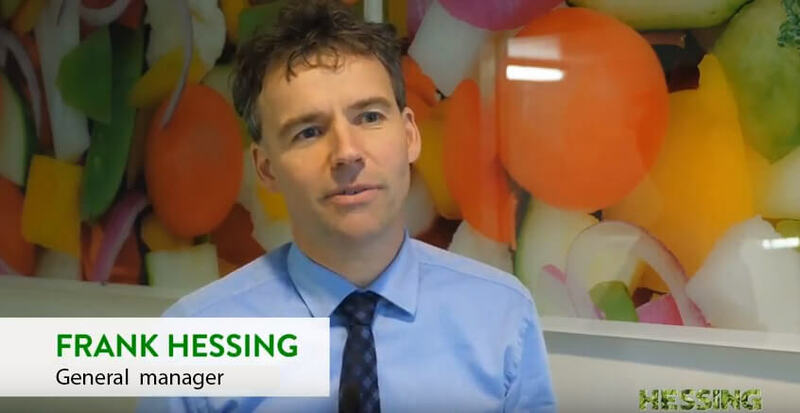 With four branches in the Netherlands, more than 1500 employees and 800 different ready-to-eat fresh products, Hessing has grown from a small family business in the North-Holland town of Zuid-Scharwoude into one of the three largest suppliers of freshly cut fruits and vegetables. As a dynamic, healthy, growing and ambitious company, with the daily challenges that are always a part of it, there is only one promise that matters to us: all our products must be easy, tasty, healthy and fresh. Or actually; super fresh! Within a few hours, thousands of kilos of fresh fruit and vegetables are inspected, cut, washed, mixed, packed and delivered. Millions of packaged fresh products are transported each week from various locations in the Netherlands, Belgium, Germany and Denmark. With all our factories we produce about 7 million packages every week. Our location in Helmond is a specialty factory for meal salads, salad dishes, raw vegetables, fresh fruit and organic production. The factory in Zwaagdijk-Oost produces cut, ready-to-cook vegetables. Our factory for food services is located in Sint Annaparochie and our location in Belfeld delivers tailor-made products to large customers. In addition, Hessing has its own transportation company, Hessing Logistics. Our teams are diverse, driven and ambitious. We offer plenty of opportunities for, among other things, education and development, collective insurance, company fitness and above all a pleasant working atmosphere. By means of craftsmanship, drive, dedication and flexibility, our employees contribute daily to the further growth and professionalization of our company. In total, more than a thousand people work at Hessing. The organization is led by Frank, the son of founder Jan. Frank's brothers Coos and Hans, and sister Marian, also work in the company. Father Jan has retired but is still attached to his company as an advisor. As you can see in the timeline below, we have grown considerably over the years and we have ambitious plans for the future. Will you join our team?